Let me make this simple for those of you without the patience to read this entire review: Snowpiercer is a masterpiece. The film begins under the premise of the government needing to take drastic and immediate action against global warming. A substance known as CW7 is launched to try to counter it but it goes horribly wrong and the world freezes over, with a large majority of the population being killed. The few remaining survivors have taken refuge on a super train riding a track that spans the entire globe with the help of a super engine. But the system in place on board the train showcases the injustice of a class system. Those who boarded with first class tickets live a life of luxury and privilege, while those at the back live hungry, dirty, and in fear of the tyranny of those in power. The film has true diversity, with people of more than once race, gender, sexuality, body type, accent, and spoken language(s). While Hollywood films have a propensity to grotesquely whitewash post-apocalyptic stories, Snowpiercer is the English language debut for South Korean director Bong Joon-ho and the film's crew is comprised of groups spanning the globe which match the diversity of the cast. There isn't a single bad performance or even a weak one. With big names such as renowned South Korean actor Song Kang-ho, Tilda Swinton, and Octavia Spencer, there is little surprise that the bar is high. But perhaps most surprising is the film's lead, Chris Evans, who delivers what may be the greatest performance of his career. The phrase "reluctant hero" seems too cliche to properly capture what makes Curtis, Evans' character, such a strong leader. Curtis is not a leader who seeks glory or a stroked ego, nor is he one who sees himself as a leader at all. The self-loathing he possesses is only overpowered by his strategic mind and sheer determination to bring a better life to those stuck in the back of the train (the lower class). Every character in this film is more than what they seem, as is the plot and the complexities woven into it. There is violence and brutality but none of it is glamourised. 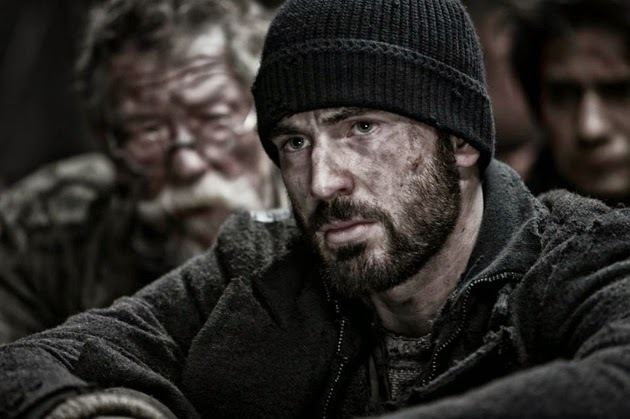 What Snowpiercer reminds viewers is that casualties in the battle for equality are not numbers on a page or a headline on a television screen, but a person, flesh and blood, with loved ones and a story that has led them to that point. The film also raises many questions and thinking points. What truly defines a person? Is it their behaviour when forced into the worst possible circumstances or how they go about dealing with the demons of their past? Once a person starts or takes part in a revolution, it is virtually impossible to go back. But even when things seem particularly bleak in the quest for equal rights and social justice, the smallest spark can change the tide. The score accompanies the film appropriately, with minor chords and occasionally slightly out of tune instruments to enhance the film's dissonance. The special effects are solid but never used as a crutch. What also makes the film fantastic is it's complete lack of predictability; something that is virtually nonexistent in Hollywood films. Snowpiercer has had a limited release in North America so take the opportunity to see it immediately before its run is finished. I would also recommend seeing it at least twice, to truly appreciate all the subtle hints and foreshadowing that can't be fully appreciated until you know how it ends.